work husband vs. home husband – Helen, Naturally! I realize that the people that read my blogs are not that familiar with me. This of course does require me to occasionally admit, own up, or spill out info on some very important menial detail(s) of my life. This is one of those such details. Many of you, okay no one except the people in the village (explanation coming soon), knows the information about me that I am about to tell all of you. Yep, I am putting it out there for all to see. Thank gawd the hubster doesn’t read my blog. Gasp…I know right! Oh well, he feels that he already knows much of what I am going to talk about since it is centered around food, and he eats whatever I develop cook. Little does he know that sometimes this thing contains some juicy gossip…okay he probably wouldn’t care about that either. I have two husbands! There I said it. I own up to it. I have two husbands. Before you all start screaming at your computers, shut down my page, and promise to stop reading immediately (please don’t) let me explain. No I am not technically “married” to two people, just one. I have my true husband, the one I come home to everyday – home husband. Then I have J! J works with me. He is a para at our school and is placed in the classroom across from me in the village. J and I are great friends. We even eat lunch together on most days. Now I have to spend a good deal of time with J because he works with some of the students that I work with as well. We pick on each other, boss each other around, ignore each other, argue occasionally, share secrets, and I even bring him food several times a week (please don’t tell J that I use him as a garbage disposal). So it is like being married at work. He is deemed my work husband. Neither one will ask me what I had or did I enjoy my breakfast. Could this be because they both know that I usually eat oats? Not sure, but my theory is that they just don’t care! 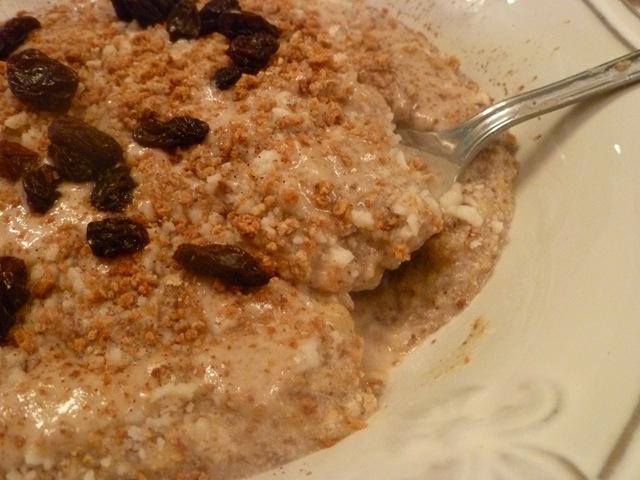 This mornings mix was super delish since I used a whole banana instead of half, and not one of them asked me about it. Since I didn’t get to gush over my breakfast with the boys, I am going to tell you guys all about it. Work husband will greet me hello in the morning, while home husband tells me goodbye. Home husband could careless about my lunch (boy don’t let me forget his), while the work husband is always interested in my lunch or mainly interested to know if I have enough for him as well. He was highly disappointed with me today. Only one slice of pizza (hey home husband took the rest). 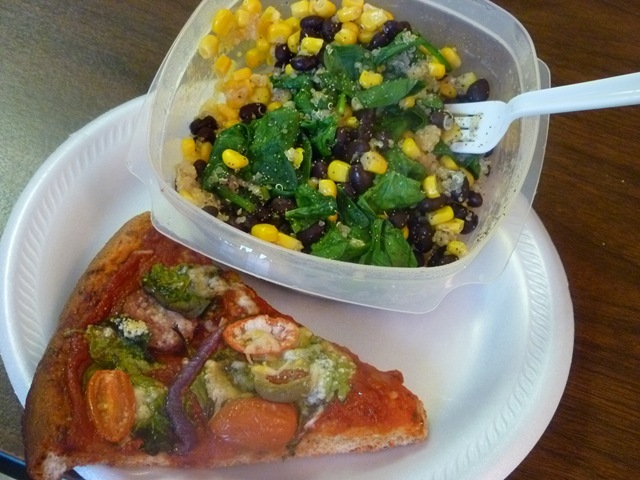 Leftovers thrown together in a salad (quinoa, corn, black beans, and spinach). Finally used of the last of these ingredients. No more quinoa 😦 Must go to Whole Foods soon! Home husband doesn’t eat snacks and doesn’t talk to me during the day. Work husband cries frowns when I do not bring a snack for him, no orange this morning (sorry I forgot on my way out), and he talks to me through out the day. So glad he wasn’t around to see the yummy PB&J on home made wheat bread that I scarfed down this afternoon. Geez he would probably whine over that one for weeks. 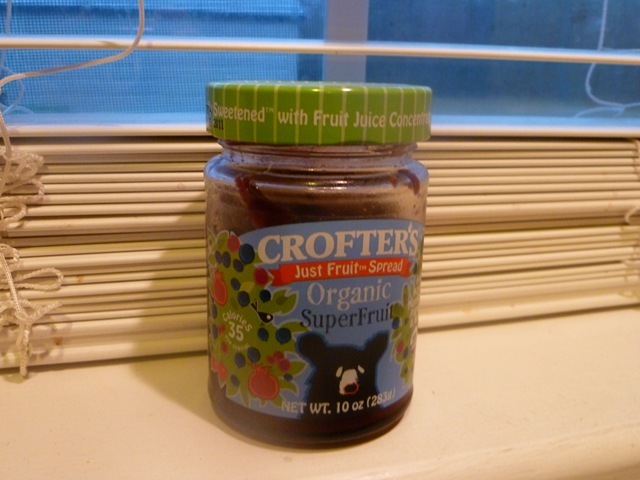 It was made with this super fruit spread from Crofter’s. I. AM. IN. LOVE. WITH. THIS! I was really excited to get this lovely little jar by receiving two coupons for two free jar’s of their spread in the mail. 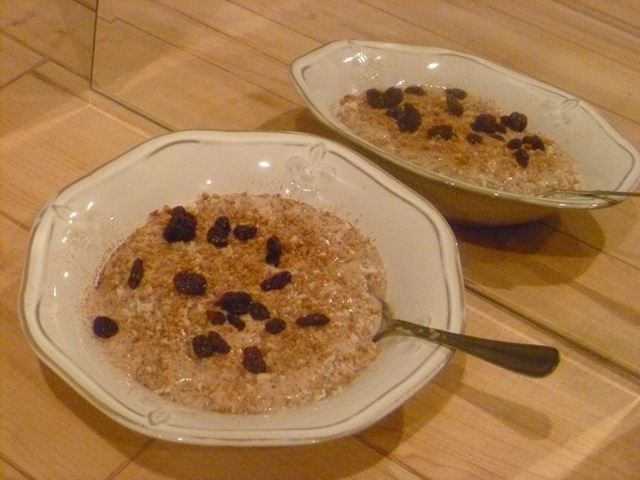 It is sweetened with natural juices which makes it clean and healthy. An actual natural spread! Work husband tells me goodbye in the afternoons while home husband is telling me hello and inquiring about my day. Of course he goes through the daily small talk but what he really wants to know is what’s for dinner! He is highly disappointed when I tell him that I have no idea at this point since I am out of groceries. He insists on a trip to the store, which I talk him out of since I get paid next Tuesday and will make the big grocery run then. He is pleased however when I inform him that we are having this: Hamburger steaks and gravy over smashed fried potatoes 🙂 One of his all time favorites! Place the olive oil in a pan and heat on medium-high heat. Add the cabbage and sauté for a minute. Pour in the tomatoes, herbs, salt, & pepper. Cover and let cook until cabbage is tender. Add the beans in and heat through. Home husband is forced willingly helps with a few household chores while I go to the gym. Work husband is no where to be found. Home husband helps get the children ready for bed in the evenings. Work husband hopefully is doing the same at his house for his home wife. Home husband kisses me goodnight and holds me tight. Work husband texts me to remind me to bring him something or do something for him the next day! So there you have it. My life and the two husbands that are in it. I am not sure what I would do without either one of them. Oh and FYI=work husband is married and a youth pastor. Do they know about each other = yes! Although home husband doesn’t exactly know that I refer to my friend J as work husband, but I can assure you he wouldn’t care. Now every married woman out there that is reading this…..yes, I accept your nomination for the best wife in the world. After all, who could put up with more than one husband? I’m sorry to say that work husband will not be getting those leftovers 😦 I am saving them for me over the weekend. He will be getting some biscotti and an orange today! Pingback: to chew or not to chew | Helen, Naturally! Pingback: Confessions & A Giveaway | Helen, Naturally! 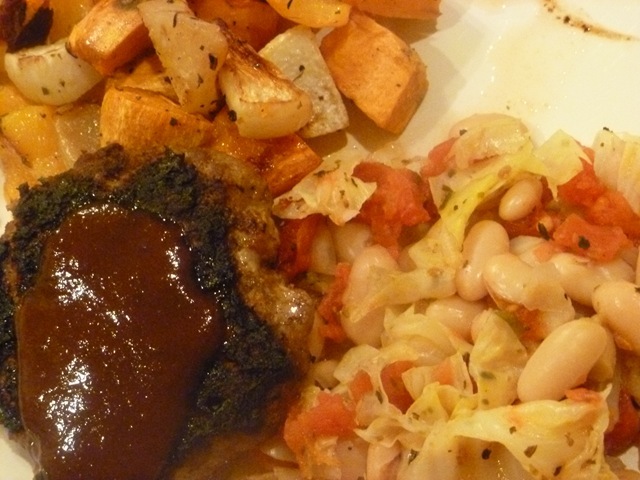 Pingback: ball game eats: part I | Helen, Naturally! Pingback: How we do it down south | Helen, Naturally!